THE “YORKSHIREMAN” leaving St. Pancras Station hauled by a 4-4-0 Midland three-cylinder compound. The high-pressure cylinder (inside) measures 19 in by 26 in, and the two low-pressure cylinders (outside) 21 in by 26 in. Diameter of the coupled wheels is 7 ft. The total heating surface is 1619 sq ft and the grate area 28.4 sq ft. The weight of engine and tender is 107 tons 12 cwt. ALTHOUGH the compound locomotive in which the steam does duty in more than one set of cylinders, has never been very popular in the British Isles, and is often regarded as a foreign invention, it really originated in England, where it was used at so early a date as 1850. The history of compounding is largely a record of experimentation. For many years after the opening of the Stockton and Darlington Railway locomotive engineers were mainly concerned with refining and improving on the original design, and increasing the power. Special attention was paid to the problem of obtaining greater power without a corresponding growth in weight. A comparison of the dimensions of “Locomotion No. 1” with, for instance, the Crampton engines of the early eighteen-fifties, indicates the extent to which these endeavours were successful. But until 1850 there was no material change to be recorded from the lines as laid down by the Stephensons. The root problem of designers, from those of the pre-1825 colliery locomotives onwards, has always been to increase the thermal efficiency, that is, to increase the power developed from each unit of coal or other fuel. With the “simple” loco-motive there is an inevitable wastage of thermal efficiency, due to the fact that when hot high-pressure steam enters the cylinder it undergoes a considerable degree of cooling off by the time that the process of expansion is completed. The cylinder temperature, which is high at the beginning, becomes relatively cool at the end of the stroke, when the process of heating has to begin over again. This variation in the range of temperature can be narrowed by lessening the degree of expansion, a process that would be wasteful in itself, but ceases to be so if the partly expanded steam passes into another cylinder, and finishes its work there. That is the process used in compounding, whether dual, triple, or quadruple expansion. 19½ in (later 20½ in) by 24 in. One of these engines had two cylinders of equal size, while in the other the area of the low-pressure piston was approx-imately 2.3 times that of the high-pressure pistons. Whether those proportions were arrived at by rule of thumb or not - the available data for Nicholson’s engines are unfortunately rather scanty - the locomotives were, of course, experimental. The correct ratio between the high- and the low-pressure cylinder capacity has always been one of the important problems confronting later designers. Apart from articulated locomotives, the two-, three-, and four-cylinder arrangement has been used on compounds. An argument against the compound principle that was at one time largely used in Great Britain, where the prejudice against the system is by no means dead, is that the extra cylinders involve additional working parts, and thus add to the expense of construction and maintenance. But the argument, which, of course, does not apply to two-cylinder compounds, loses much of the weight it may ever have had when we bear in mind the extent to which three- and four-cylinder non-compounds are nowadays used on the most exacting duties. It was not until twenty-one years after the Nicholson engines were put in service that the triple-expansion marine engine, which soon led to the quadruple-expansion type, was patented. On the railways, compounding also marked time in all countries, and the real history of locomotive compounding does not begin until 1876, when the French engineer, A. Mallet, introduced a compound locomotive on the Bayonne-Biarritz Railway. In 1878 Mallet showed at the Paris Exhibition the first compound tank engine ever built. The German engineer, A. von Borries, whose work at a later date so strongly influenced the locomotive designs of the North Eastern Railway was in the field about the same time, but Mallet’s ideas were the first to materialise to any important extent in practice. Mallet’s pioneer locomotive had two cylinders. Its designer is principally known as the inventor of the articulated locomotive bearing his name, and so far as he is concerned compounding may be said to have been a by-product. He aimed at building a type of locomotive that should easily traverse the sharp curves on the Bayonne-Biarritz Railway, and conceived the idea of constructing the driving wheels and cylinders so that they could pivot as a unit, and of mounting two such units on a single frame. The “triplex” type subsequently adopted in the United States is a further development. Mallet’s work was destined to exercise an important influence on F. W. Webb, the Locomotive Superintendent of the London and North Western Railway from 1871 to 1903. Compounding is particularly associated in Britain with his name. Webb became familiar with the pioneer work of Mallet, and decided to give a trial to the French engineer’s system. In 1878-9 he converted an outside-cylinder six-wheeled “single”, a process involving the reduction of the diameter of one of the cylinders from 15 in to 9 in. This engine was put to work on the Ashby and Nuneaton branch, where it handled passenger traffic for about four years, and “the elements of success seen in its working”, to quote Webb, were regarded by him as sufficient to justify experiment on a larger scale. In 1882 Webb introduced the first of his three-cylinder compounds, the leading feature of which was that the driving axles were not coupled; the two high-pressure cylinders, which were outside, worked on to the rear axle, while the front drivers were actuated by a single low-pressure cylinder. These locomotives were thus known as “double singles”. The first of this class, which was aptly named “Experiment”, had 6 ft 7½ in driving wheels, and the diameter of the high- and low-pressure cylinders was 11½ in and 20 in respectively, the stroke of all three being 24 in. “Experiment” was followed in 1883 by a slightly revised version, known as the “Compounds”, after the name of the first of the batch, the principal difference being that the high-pressure cylinder diameter was enlarged to 13 in, as it was found that the “Experiment” did not have enough power at starting. But, despite this defect, “Experiment” could haul a sufficiently big load when the occasion demanded. To quote Webb again, immediately it left the “shops” at Crewe, and before it was painted, he “hooked it on to assist a heavy express from Liverpool with nineteen coaches”. He tried it with the steam of the other engine shut off for some distance along the Trent Valley. They ran without trouble from Crewe to London. The following morning “Experiment” took the morning mail to Holyhead. When the engine arrived at its destination it was still in good condition, and Webb “then gave the men something to eat, turned the engine round, and hooked it to the boat express, which it took to Crewe. The engine thus did 528 miles as a christening trip”. “Compound” inaugurated its service career by hauling the 10 am Scottish express, of thirteen coaches - predecessor of the “Royal Scot” - all the way from London to Carlisle, and “at the foot of Shap Fell, with its gradient of 1 in 75 for five miles, it paused for one moment disdainfully to refuse the assistance of the ‘bank’ engine that was in waiting according to custom to help the train up the incline, and then pursued unaided its victorious career”. It must be rememb-ered, however, that the coaches of those early days weighed considerably less than half the weight of modern British vehicles. 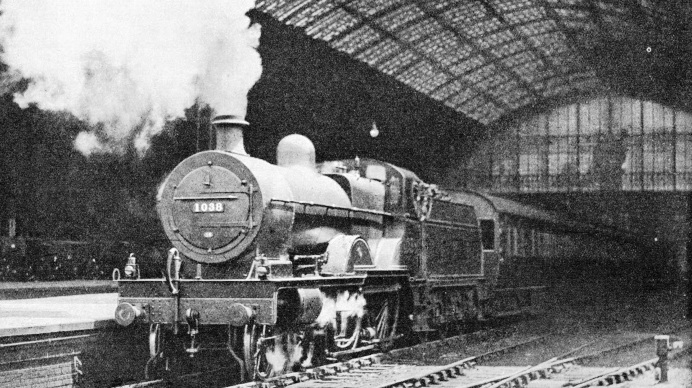 ONE OF THE “TEUTONICS”, the most successful class of three-cylinder compound express engines designed by Webb for the London and North Western Railway. The high-pressure cylinders measured 14 in by 24 in, and the (inside) low-pressure cylinder 30 in by 24 in. Diameter of driving wheels was 7 ft 1 in. Engine and tender weighed, in working order, 73 tons 2 cwt. The Webb compounds have often been described, but a few historical particulars may be given. Of the uncoupled six-wheel-ers, or 2-2-2-0’s, there were eighty in all, namely “Experiment” and the twenty-nine “Compounds”; forty “Dreadnoughts”, which were larger and more powerful, with high-pressure cylinders of 14 in, and a low-pressure cylinder of 30 in diameter, but driving wheels of only 6 ft 3 in diameter; and ten “Teutonics”, which were still larger, and had 7 ft 1 in driving wheels. It is recorded that the old wheel centres of McConnell’s “Bloomers” (2-2-2 express engines) were used on these engines. The “Dreadnoughts” were built in 1884-88, and the “Teutonics” in 1889-90. Three of the "Teutonics" were of unusual historical interest. “Jeanie Deans” used for years to haul the heavy afternoon Scottish express out of Euston every week-day. “Pacific”, whose low-pressure cylinder had a diameter of only 20 in as compared with the 30 in of her sisters, was originally built as a “continuous expansion” engine, which could be worked both “with boiler steam in all three cylinders on heavy gradients and at starting, or the steam could be expanded in all three”. Very little is known of the working results in this form, which were “shrouded under an impenetrable silence”, but the fact that “Pacific” was soon converted to the standard dimensions of her class suggests that the modification was not successful. “Ionic”, of the same class, ran from Euston to Carlisle, 299 miles, without a stop, in 1895. This was a non-stop record at the time. In addition to these classes of express engine, Webb built four three-cylinder tank locomotives on which the drive was divided. The first was reconstructed in 1884 from one of the Beyer Peacock “Metropolitan” tanks. This locomotive retained its leading bogie, at that time and for some years after a rarity in London and North Western locomotive practice. The other three, which were built between 1885 and 1887, were all of “double-ender” type. WEBB’S FIRST THREE-CYLINDER COMPOUND express locomotive was brought out in 1882 and called the “Experiment”. This engine had two high-pressure cylinders 11½ in by 24 in and one low-pressure cylinder 26 in by 24 in. The driving wheels had a 6 ft 7½ in diameter and the weight of the engine and tender, in working order, was 62 tons 15 cwt. The first of these, officially described as a “Patent Engine for Suburban Work”, was employed on the “Outer Circle” route between Broad Street and Mansion House - one of London’s numerous vanished train services. On starting it communic-ated to the train a “peculiar fore-and-aft surging movement” to such an extent as to “earn for itself more unpopularity with the travelling public than probably any other locomotive ever built”. The last of the three was originally intended to be a goods tank; but, instead of coupling the three rear axles, Webb adopted the device of coupling on to the trailing and central driving wheels, which were actuated by the high-pressure cylinders, while the leading pair was driven by the low-pressure cylinder. The wheel arrangement was thus unique. ENGINE No. 1619 of the North Eastern Railway, built in 1893 as a two-cylinder compound and rebuilt as a three-cylinder compound in 1898 on W. M. Smith’s system. The reconstructed engine had one high-pressure cylinder (inside) 19 in by 26 in and two low-pressure cylinders (outside) 20 in by 24 in. The driving wheels had a diameter of 7 ft 1¼ in, and the total weight in working order was 92 tons, including tender. The “double single” arrangement was also employed on the later eight-wheeled express engines of the “Greater Britain” and “John Hick” classes. A special feature of these engines was the unusually long boiler, which was divided into two lengths by a combustion chamber. Ten were built of either class; the “Greater Britains”, with 7 ft 1 in driving wheels, and the “John Hicks” with 6 ft 3 in driving wheels. These two classes were the only British tender engines to have the 2-2-2-2 wheel arrangement. “Greater Britain” appeared in 1891, the “John Hicks” between 1894 and 1898. In either class the high-pressure cylinders were 15 in by 24 in, and the low-pressure cylinder 30 in by 24 in. Webb’s later compounds were of more orthodox type, the “double single” principle being discarded. In 1897 there appeared the first of the “Jubilee” class of 4-4-0 four-cylinder compounds. These had 7 ft 1 in driving wheels, two high-pressure cylinders 15 in by 24 in, and two low-pressure cylinders 19½ in (later 20½ in) by 24 in. All four cylinders drove the leading coupled axle. Forty “Jubilees” were built. In 1901 Webb brought out the first of forty “Alfred the Greats”, which were enlarged “Jubilees”. The high-pressure cylinders were 16 in by 24 in, the dimensions of the low-pressure cylinders being unaltered. After Webb’s retirement the “Alfred the Greats” were rebuilt with improved valve gear. “Jubilees” and “Alfred the Greats” alike were later converted to simple 4-4-0’s of the “Renown” class, except such of them as went direct to the scrap-heap, and one locomotive which was experimentally fitted with a superheater towards the end of its career. Between 1893 and 1900 Webb built 111 three-cylinder compound 0-8-0 goods locomotives. All the survivors of this class were converted after 1904 into two-cylinder simples. They were eventually superheated, as were the four-cylinder comp-ound 0-8-0’s of 1901, after their conversion to two-cylinder simples. In 1895 Webb made a further alteration to his earliest compound, now named “Triplex”, by converting it to triple expansion. In this form the locomotive was not a success; it is recorded that it had “great difficulty in starting even with one coach behind the tender”, and as it fared no better on its occasional trips with Webb’s inspection coach, it was scrapped in 1903. The last locomotives designed by Webb were four-cylinder compound 4-6-0 express goods locomotives, with 5 ft 3 in driving wheels, two high-pressure cylinders 15 in by 24 in and two low-pressure cylinders 20½ in by 24 in. Webb’s compounds provoked an embittered controversy in his day, and the conflict has not yet died down. It has to be admitted that the performance of the various types of Webb engines was of distinctly unequal merit, and that the least satisfactory were the “John Hicks”, but that does not involve wholesale condemnation, and there are two sides to the question. Criticism was mainly concerned with sluggish starting, due to the fact that Webb made no arrangement to admit high-pressure steam to the low-pressure cylinders on starting. Imperfect synchronisation in the non-coupled classes was another defect, and it is significant that in his later designs Webb reverted to the orthodox coupling rod. It has always been admitted, also, that the Webb compounds burned more coal per mile than the engines they replaced. But the latter were small; the most powerful London and North Western express engines in service before the introduction of the “Experi-ments” were the small 2-4-0 “Precedents”. One result of their replacement by the compounds was an appreciable reduction in double-heading, and Webb’s defenders have always contended that on the basis of power developed in relation to coal consumption, the “Experiments”, “Teutonics”, and “Dreadnoughts” were more economical than the non-compounds. But there is no doubt that at the date of Webb’s retirement the locomotive power available on the London and North Western Railway was inadequate to the demands of the period. 24 in and its low-pressure cylinder 28 in by 24 in. The driving wheels had a diameter of 7 ft 7¼ in and the working pressure was 175 lb per sq in. The total heating surface was 1,139 sq ft, and the grate area 20.7 sq ft.
Compounding on any considerable scale came relatively late in the United States, largely because the 4-4-0, or “American type”, was so popular that engineers were loth to abandon an old and tried favourite, and therefore endeavoured to give it greater and greater power. To quote one of the best known historians of the locomotive, “the intensity of the popular desire to keep that type of locomotive in use may be judged by the ingenious efforts made to enlarge the grate area”, which, incidentally, involved the increase of the distance between the driving wheels until coupling rods reached the length of 9 ft. But by about 1885 the 4-4-0 was rapidly being abandoned for goods work, its place being at first taken by 2-6-0’s and 4-6-0’s, after which came the “Atlantic”, or 4-4-2, and the 2-6-2. In 1889 Samuel Vauclain patented the compound engine associated with his name. This is a four-cylinder engine in which a high- and a low-pressure cylinder are grouped together so that both pistons connect with a single crosshead. The type speedily became popular, and within less than twenty years two thousand of the Vauclain compounds had already been placed in service. In this same year, 1889, another American engineer, Albert Pitkin, patented an interception valve for a two-cylinder com-pound. In this system, the locomotive worked as a “simple” on starting, but automatically became compound directly the receiver pressure reached a predetermined point. The device was subsequently improved by designing the valve so that if increased power was at any time required, as on gradients or with an unusually heavy load, the engine could be made to work as a “simple”. Vauclain also designed, in 1904, a four-cylinder balanced compound, in which the valves supplied steam to both an inside and an outside cylinder. It was about this time that the “Mallet” articulated compound was coming into use in the United States; by 1906 the Great Northern Railroad already had in service a 2-6-0 + 0-6-2 tender locomotive with a heating surface of 5,658 sq ft. The von Borries system of compounding was employed by T. W. Worsdell, who was successively Locomotive Engineer of the Great Eastern and North Eastern Railways. The characteristic of the von Borries system, which has been extensively employed in England and elsewhere, is that it makes use of only two cylinders, and is thus specially suitable when it is desired to use inside cylinders. Between 1882 and 1883 Worsdell built a batch of twenty 2-4-0 “simple” express engines for the Great Eastern, and in 1884 converted one of these to a 4-4-0 compound, replacing the single pair of leading wheels with a bogie truck. A further ten were built to the same design. When Worsdell went to the North Eastern Railway he built in 1886 a two-cylinder 2-4-0 compound express engine, which was followed in 1887 by a batch of ten 4-4-0’s. In the next year came the first of ten inside-cylinder bogie “singles”, which, as with all Worsdell’s engines, were distinguished by their roomy cabs. The principal dimensions of this celebrated class were: high-pressure cylinder, 18 in by 24 in; low-pressure, 26 in by 24 in; driving wheel diameter, 7 ft 1¼ in; total heating surface, 1,136 sq ft; working pressure, 175 lb; weight in working order (locomotive alone), 42¾ tons. These were followed in 1889 by the first of another batch of ten, having 7 ft 7¼ in driving wheels, high- and low-pressure cylinders with a diameter of 20 in and 28 in respectively, and a weight of 46¾ tons in working order. COMPOUND GOODS LOCOMOTIVE, built by Webb in 1903, for the London and North Western Railway. The coupled wheels had a 5 ft 3 in diameter and there were two high-pressure cylinders, 15 in by 24 in stroke, and two low-pressure cylinders, 20½ in by 24 in. The weight of engine and tender, in working order, was 91 tons 12 cwt. For a variety of reasons, chief among which was the unconventional nature of Webb’s earlier designs and the striking personality of the designer himself, the North Western compounds received a perhaps undue share of the limelight. It is, therefore, only fair to recall that Worsdell was responsible for a comparable variety of compound types. In fact, the North Eastern made use of compounds for a longer period and with more consistent success than any other pre-grouping British railway. In addition to the classes already mentioned, those built by Worsdell included 0-6-0 tender goods and 0-6-2 side tanks. His brother and successor at Gateshead, Wilson Worsdell, built in 1893 a two-cylinder compound 4-4-0 with 7 ft driving wheels. In 1898 it was rebuilt as a three-cylinder compound. Reference has already been made in the chapter “Unconventional Locomotives”, beginning on page 595, to the four-cylinder tandem compound was built in 1885 for the North British Railway, and to Dean’s two engines on the same principle for the Great Western in the following year. These three were the only tandem compounds ever in operation on British railways. Extensive use of three-cylinder compounds - a type still perpetuated by the LMS in 1935 - was made by the Midland. In 1901, S. W. Johnson, then Locomotive Superintendent of the Midland Railway, introduced the first of a batch of 4-4-0’s, with 7 ft driving wheels, built on the system invented by W. M. Smith. Each of these had a single inside high-pressure cylinder, 19 in by 26 in, with a piston valve beneath, and two low-pressure outside cylinders, 21 in by 26 in, with vertical unbalanced slide valves inside the frames. The cylinder ratio was 1 to 2.45, and the boiler pressure 195 lb. The outside cranks were placed at 90 degrees and the middle inside crank at 135 degrees with the other two. The three cylinders drove on to the same axle, which carried three sets of Stephenson’s gear and six eccentrics. The exhaust from the high-pressure cylinder passed into a steam chest common to the low-pressure cylinders, and this way the necessity for a receiver pipe was eliminated. The first five engines of this class had independent high- and low-pressure reversing gears, but in the modified form subsequently introduced by Deeley, only a single reversing gear was provided. The Deeley engines have been described by a great authority as “the best compound engines in this country”, and it is noteworthy that the design has been continued by the LMS, which has at present nearly 250 of the type in service. Those built since grouping have had the driving-wheel diameter reduced to 6 ft 9 in. An ingenious feature of these engines is the way in which a small movement of the regulator handle opens a port admitting high-pressure steam direct to the low-pressure cylinders, to allow of rapid starting. Once the train is under way the regulator handle is moved right over, and full compound working begins. Other British compounds of note include three four-cylinder 4-4-2 “de Glehns”, imported from France by the Great Western Railway between 1903 and 1905; three Great Northern four-cylinder compound engines having the same wheel arrange-ment; some two cylinder 2-4-0 tender engines built for the Belfast and Northern Counties Railway in 1890; and a two-cylinder 4-4-0 placed in service on the Great Southern and Western in 1894. The compounds of the Belfast and Northern Counties Railway, which gave such satisfaction that the type continued to be built down to 1908, were equipped with von Borries disk-intercepting valves and inside Walschaerts valve gear, and were the first locomotives in the United Kingdom to be fitted with the latter device, with the exception of an 0-4-4 single “Fairlie” side-tank built for the Swindon, Marlborough and Andover Railway in 1878. The Great Northern Railway of Ireland possesses some three-cylinder compound 4-4-0 express locomotives somewhat similar in design to the Midland compounds. The present position in regard to compounding may fairly be summarised by saying that, while British practice favours the multi-cylinder “simple” for express passenger work, Continental railways, and in particular those of France, Germany, and Italy, have standardised on compounding. But the latest types of European express engines designed for exceptionally high speeds have simple expansion. Among these are the German 4-6-4’s, with ten wheeled tenders, built in 1935, and the “Series 61” double-ender streamlined 4-6-4 tanks that have been constructed for the purpose of making a practical comparison between steam and Diesel traction. A typical example of Continental practice is provided by the Northern Railway of France “Super-Pacifics”, which have done so much to maintain the prestige of the first great European railway to specialise in high spends. These “Super-Pacifics” are of the four-cylinder type, and a characteristic feature is that the high- and low-pressure cylinders do not have a common stroke, the high-pressure cylinders being 17¼ in by 26 in and the low-pressure cylinders 24½ in by 27¼ in. The driving wheel diameter is 6 ft 2¾ in, the heating surface and grate area are respectively 3,292 and 37.7 sq ft, the working pressure is 228 lb per sq in, and the weight of engine and tender 155¾ tons. The tractive effort is 35,185 lb when working comp-ound, and 47,840 lb when working as a “simple”. Compound “Pacifics” are also identified with the Paris-Orleans Railway, over whose tracks the celebrated “Sud Express” runs between Paris and Bordeaux. This system also employs compound 4-8-0’s. Further and more detailed reference to modern compound practice in Europe will be made in a later chapter. It would take a bold man to forecast the future of compounding in Great Britain. There are fashions in locomotive design as in everything else, and British locomotive history can record many swings of the pendulum. A type of locomotive that is regarded as outmoded in one decade may have a remarkable revival during the next decade. You can read more on “British Express Locomotives”, “Experimental Locomotives” and “Speed Trains of Britain” on this website.